This remarkable set spans up to 175 years of U.S. Eagle history. The set includes the famed type designed by Augustus Saint-Gaudens. Original Examples of American coinage. The coins feature a Liberty Head with coronet and Liberty Head with Indian Headdress. The $10 Eagle Set is comprised of two original coins, one from the era 1838-1907 and the other from 1908-1933. Furthermore, this set spans up to 175 years of U.S. Eagle history – including the famed type designed by Augustus Saint-Gaudens. The Eagle was one of the very first gold coins ever to be struck in America, so-called because it bore the image of an American eagle. This majestic bird was chosen as the emblem of the U.S.A. in 1782 at the birth of the nation and has featured on U.S. coinage ever since. President George Washington received the very first issue of this new $10 coin in 1795. 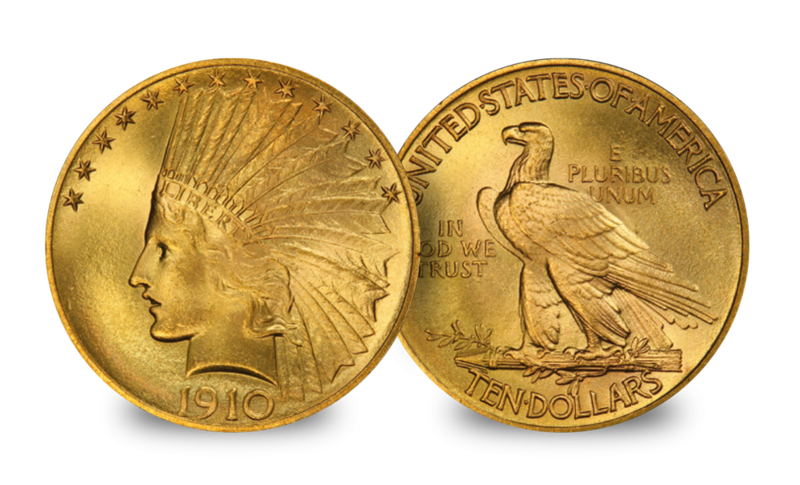 Due to the recall of gold coins to the U.S. Treasury in 1933 and their subsequent melting down, early American gold coins such as the Eagle have become very hard to find. As few as 1% of gold coins issued before 1933 are thought to survive today. 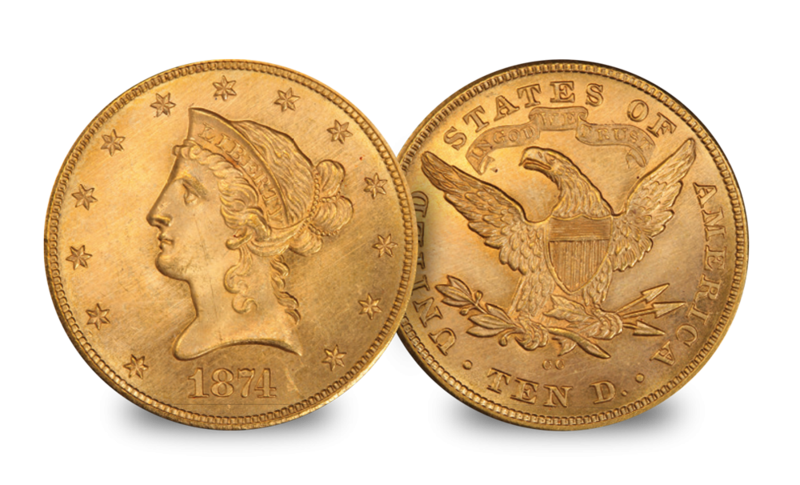 The Liberty head with a coronet design was the second issue of the Eagle, introduced in 1838 on the reduced gold standard after an absence of more than 30 years – no $10 Eagles had been struck since 1804. This new eagle design was the work of Christian Gobrecht, whose classical depiction of Liberty wearing a coronet was to feature on the obverse for almost 70 years. On the reverse is a heraldic American eagle with a shield at the centre and wings outstretched. Coins minted after 1866 have the motto ‘IN GOD WE TRUST’ added into a scroll above the eagle. This was replaced in 1908 by the ‘Indian Head’ design by celebrated sculptor Augusts Saint-Gaudens, as part of President Roosevelt’s plan to ‘beautify’ American coinage. This coin was minted until 1933, when the U.S. Government effectively confiscated gold from circulation. The obverse of the $10 Indian Head features a personification of Liberty wearing a traditional Indian headdress. The reverse shows an American eagle majestically perched upon a cache of arrows.